^ a b Braude, Ann Braude (2001). 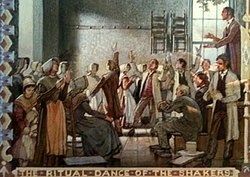 Radical Spirits: Spiritualism and Women's Rights in Nineteenth-Century America, Second Edition. Indiana University Press. p. 296. ISBN 0-253-21502-1. ^ Britten, Emma Hardinge (1884). 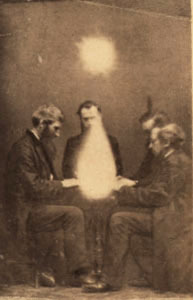 Nineteenth Century Miracles: Spirits and their Work in Every Country of the Earth. New York: William Britten. ISBN 0-7661-6290-7. ^ Times, New York (29 November 1897). THREE FORMS OF THOUGHT; M.M. Mangassarian Addresses the Society for Ethical Culture at Carnegie Music Hall.. The New York Times. pp. 200. ^ a b 風間 2013, pp. 64-65. ^ Carroll, Bret E. (1997). 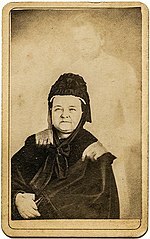 Spiritualism in Antebellum America. (Religion in North America.). Bloomington: Indiana University Press. ^ a b c 風間 2013, p. 65.